Photographs by the author. Click on images to enlarge them. You may use these images without prior permission for any scholarly or educational purpose as long as you (1) credit the photographer and (2) link your document to this URL in a web document or cite the Victorian Web in a print one. Falmouth Court House. c. 1815. Earthquakes and hurricanes have taken their toll but, as with Great Houses and Anglican churches, a surprising number of public buildings have survived from the Georgian era. 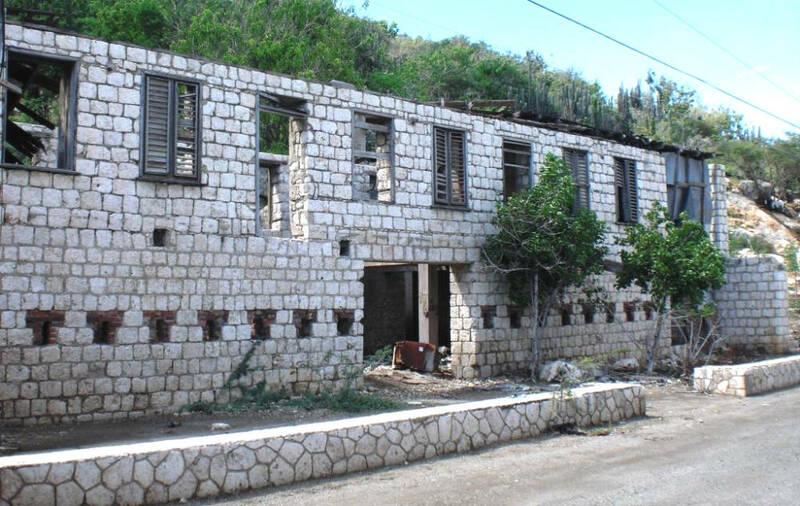 Indeed there is a thriving Georgian Society of Jamaica set up in 1967 to preserve the Georgian heritage of the island. The Georgian usually exhibits a principal facade which is intended to receive primary attention. On these grand fronts the giant column is a feature spanning two floors. Keystones emphasize the facades and quoins visually strengthen the building corners. The ground floor is sometimes fitted with the service rooms and kitchen. The upper floors are smooth as a contrast, and the first floor is usually where the principal rooms are located, the floor of taste. Windows on this floor are often designed larger than the others to emphasize the importance of the rooms behind. The principal rooms of the more palatial structures are sometimes double-height and have balustraded verandahs. The facades are usually divided by regularly-spaced openings with centrally-placed doorways. The primary facade is often given prominence by the addition of a portico. Green draws a distinction between classic Georgian style of 1720 to 1760 and a later “Transitional Georgian” from 1760 to 1790 that sought to modify the style to local Jamaican climatic conditions and finally a “Jamaican Georgian” style from 1790 to 1838. She particularly cites measures to mitigate the heat; such as louvred windows or jalousies, and “sheds” or “piazzas” built around the grounds floor walls to protect the outer walls from the direct sunlight. Brick was a frequent choice of material for civic buildings, although there are many examples of stone structures particularly in the earlier years of colonisation and in the Great Houses. In the early period bricks were brought in as ballast in the ships on their outward journey from England, but later most were made on the island. Spanish Town Square. Watercolor. James Hakewill. 1825. 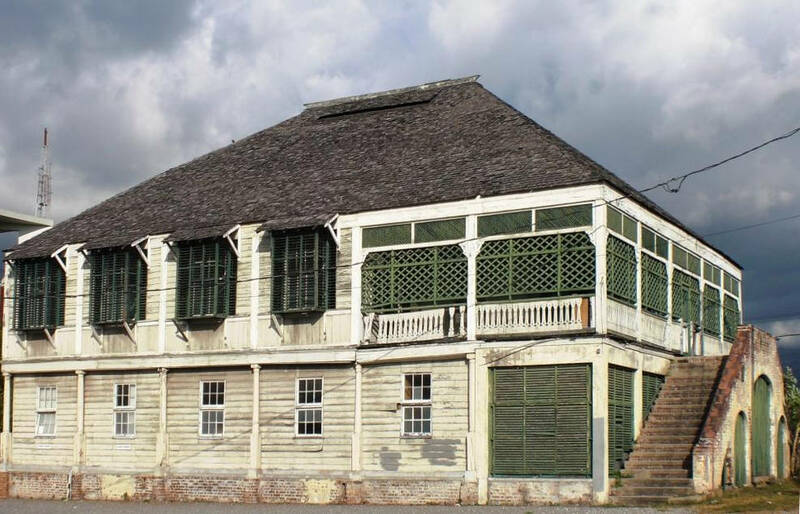 The King's House, Spanish Town 1762. 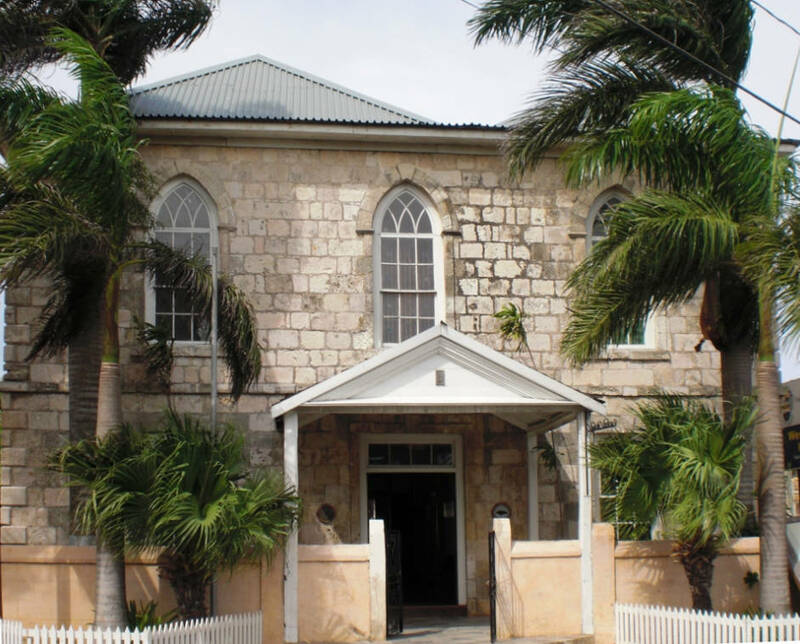 Directly opposite the King’s House is the House of Assembly, which also dates from the 1760s. 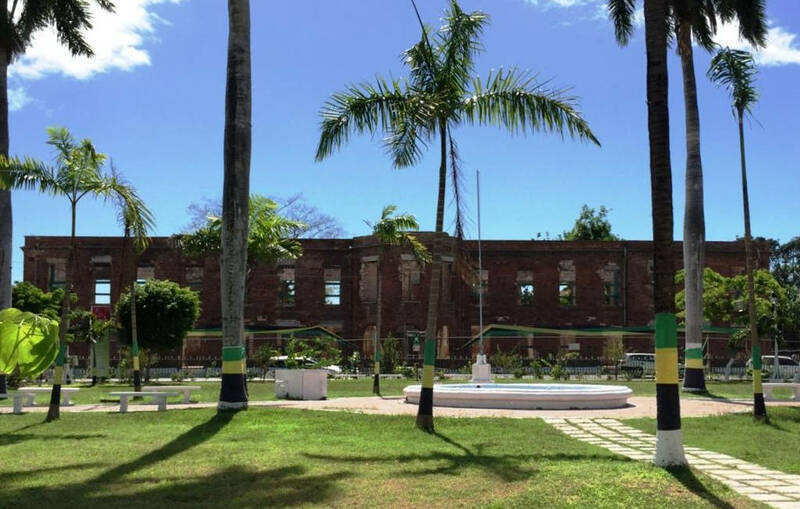 Green describes it as, “One of the most significant buildings in the development of Jamaican architecture which brings into focus the type of building expressing a transitional mode on the island. The building has survived, and has been in continuous occupation as government offices, since its construction which began about 1756. Its appearance has been criticized from as early as the eighteenth century by historian Edward Long who termed it a ‘colossal building,’ and remarked that ‘this huge pile of brick and mortar is rudely raised into two stories’” (p. 72). 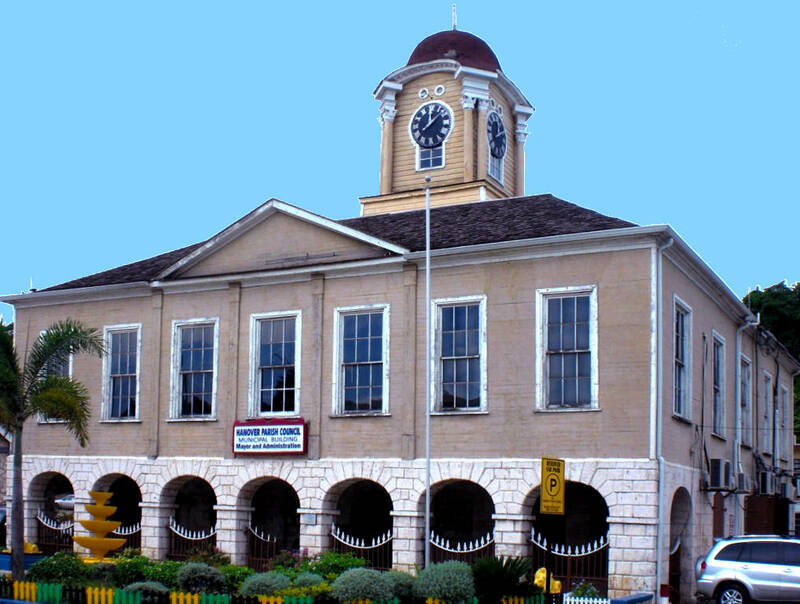 Left: Spanish Town courthouse. c. 1891. 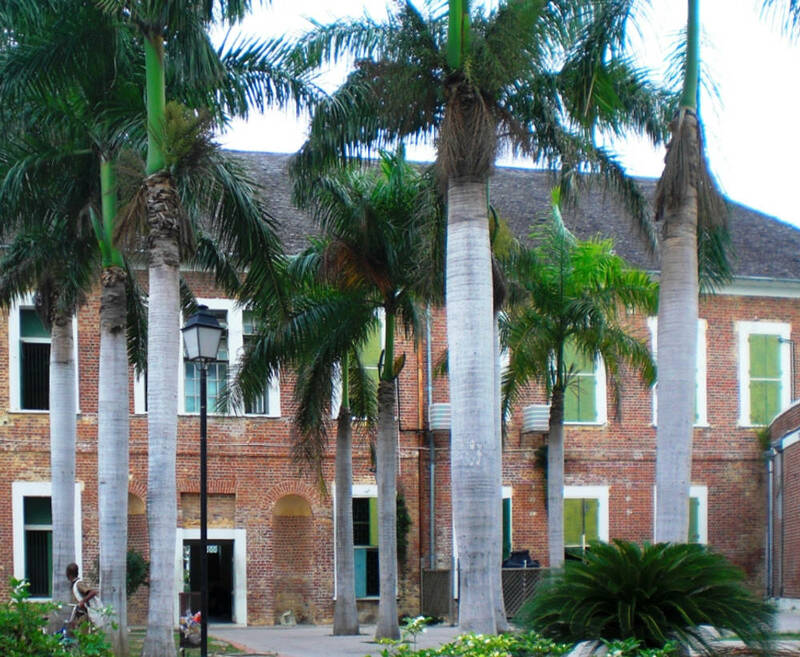 Right: The House of Assembly, Spanish Town. 1762. 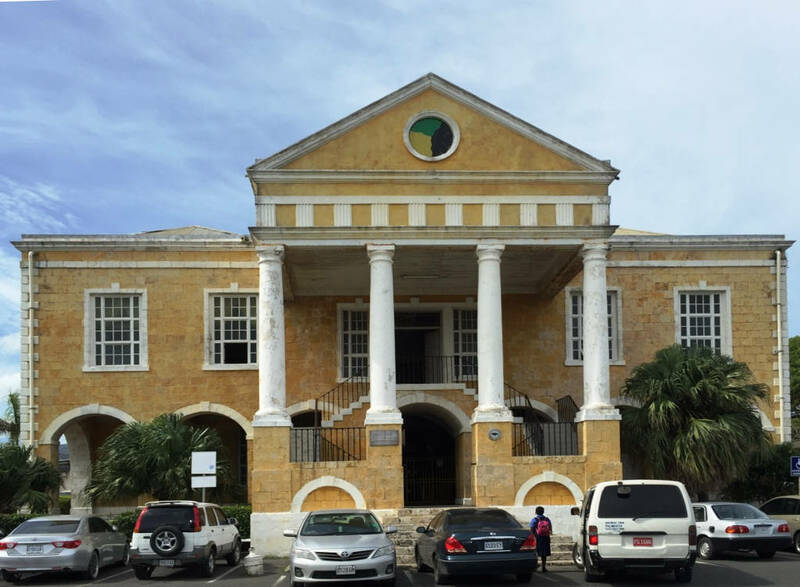 The north of the square is occupied by the statue of Admiral Rodney and the Jamaican Archives and opposite, on the southern side, stands the Court House, designed by James Delaney and completed in 1819. This building was burnt down in 1986. I have included photographs of other Georgian buildings in Spanish Town. One is the Masonic Lodge on the corner of Ellis Street and White Church Street, opposite the Cathedral. 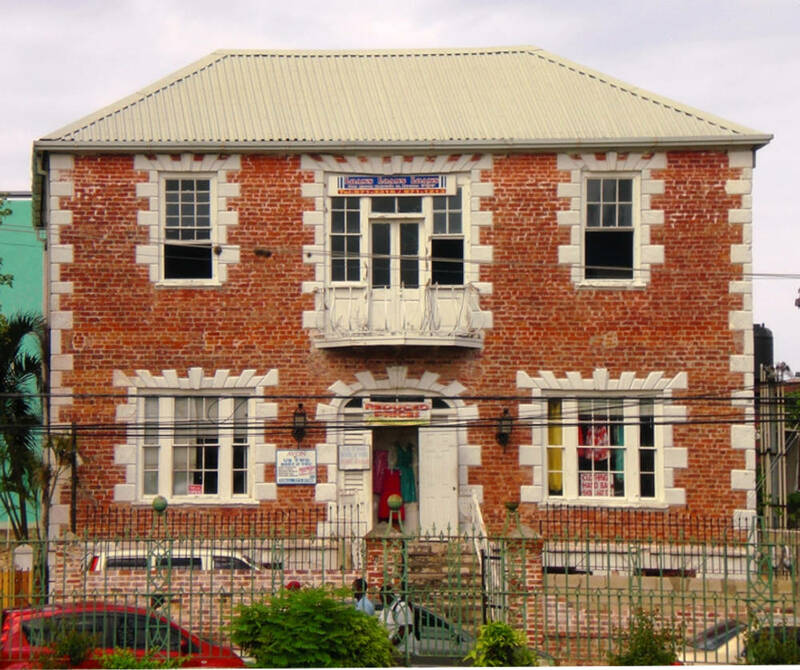 Left: Freemason's Lodge, Spanish Town. 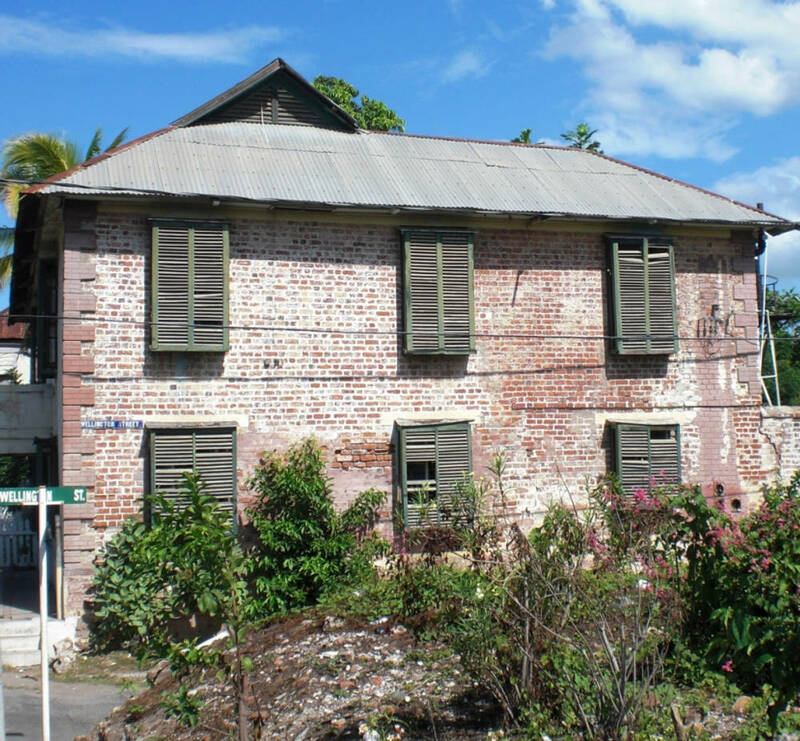 Right: House on King's Street, Spanish Town. Freemasonry was strong in Jamaica and I have found references to nine Lodges in Spanish Town; including 253 Unnamed (1746-1773), 692 Clare (1814 to 1832) , 696 Concord (1814-1862), and 1744 De la Vega (since 1995), the last of which still meets on the third Wednesday of every month. 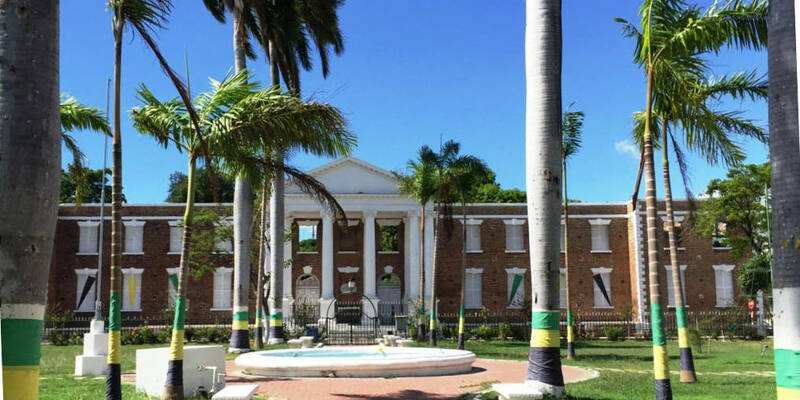 The District Grand Lodge of Jamaica (established 1771) is an offshoot of the Grand Lodge of Scotland (1736); in itself an interesting reflection of the proportion of Scottish settlers at the time. I have also included a small house on the corner of Wellington Street and a once important official residence on King Street. This last, in particular, provides evidence of “Transitional Georgian”. It is now much dilapidated but old photographs show it with a piazza and a first floor gallery and louvred windows. Three stone buildings: Left: Rodney's Arm. Port Henderson. Middle: Dockside warehouse. Port Henderson. Right: Powder Magazine. Fort Charlotte. c. 1761. Maria Nugent, the young wife of the Governor in the early 1800s, often went early in the morning to Port Henderson where she used to bathe her baby. Port Henderson was a thriving harbour until the capital moved from Spanish Town. Nowadays there is a remarkable line of derelict eighteenth-century buildings. 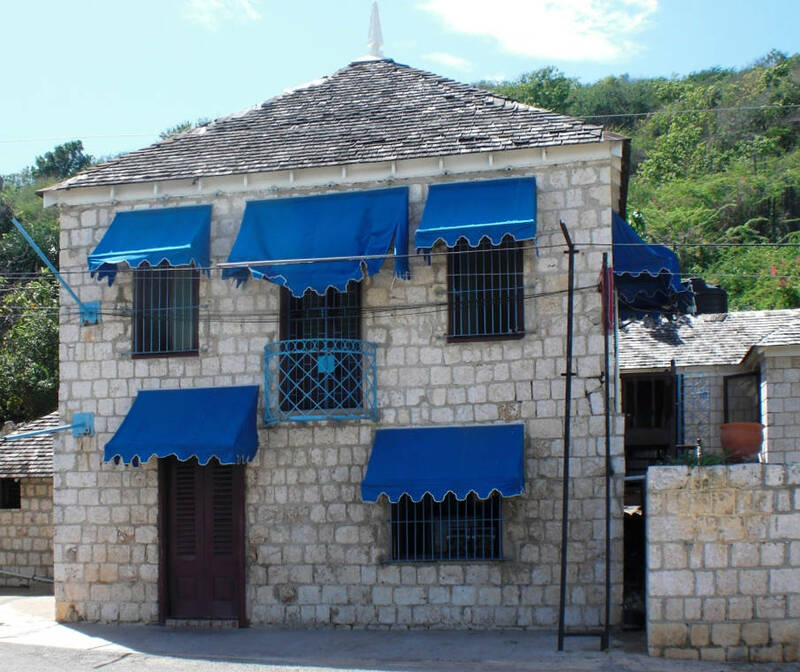 Only one is still inhabited; the Rodney Arms seafood restaurant enlivened by its bright blue awnings. Nearby is a merchant’s warehouse, sometimes described as a chapel due to its gothic arches. Left: Longhouse. Port Henderson. Right: Warehouse at Lucea docks. A third building, known as the “Longhouse” is the most impressive of all, with its loopholed ground floor and principal rooms above. The loopholes date it to pre-1782 when the threat of French invasion was at its height. 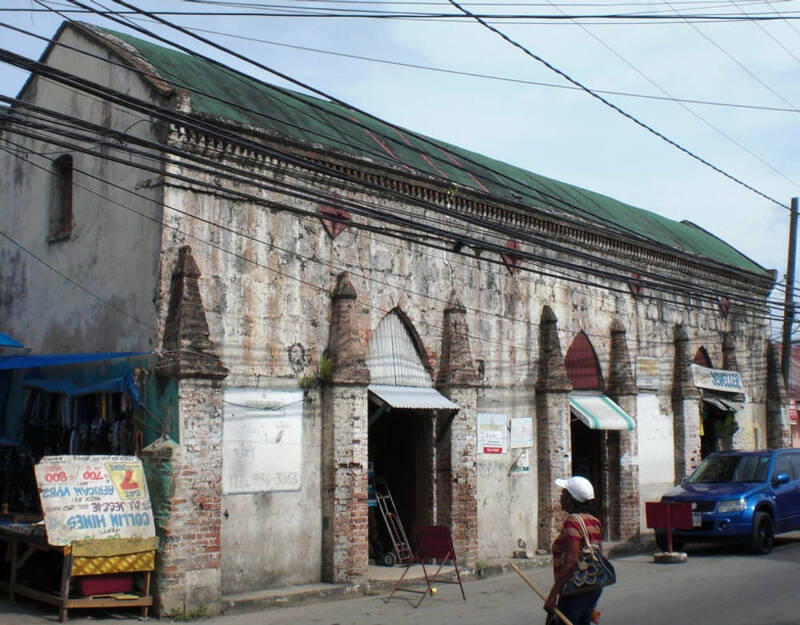 It could have been a merchant’s house or possibly a Customs building. 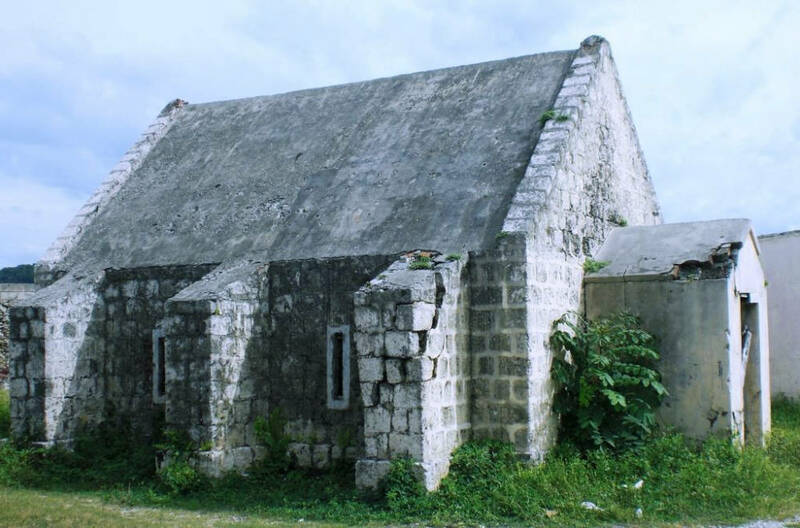 It is notable that all the dozen or so buildings in Port Henderson are built of stone, which dates them to the early Georgian period, as does my photograph of the powder magazine (artillery store) at Fort Charlotte at Lucea on the north coast. 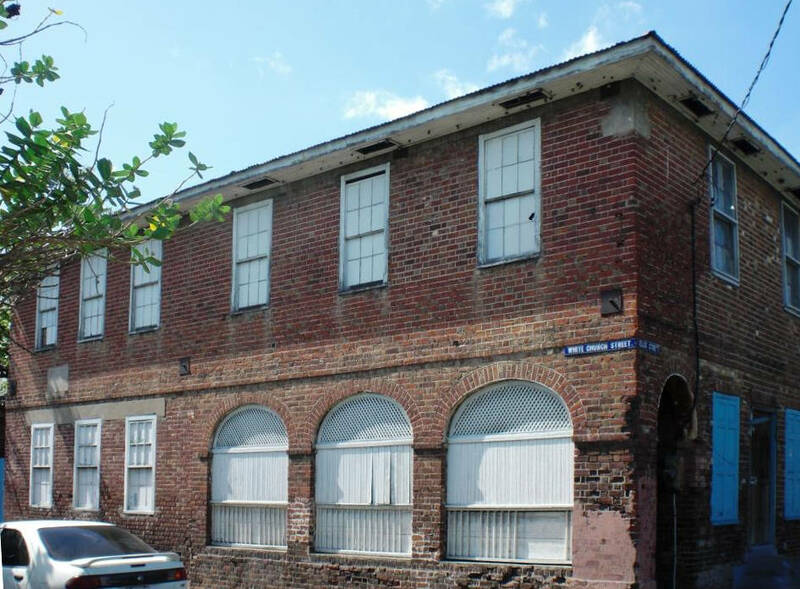 By contrast I have included a photograph of a warehouse also in Lucea with gothic arches but built of brick which probably is late 18th Century. Left: Vermont House, Falmouth. c. 1832. 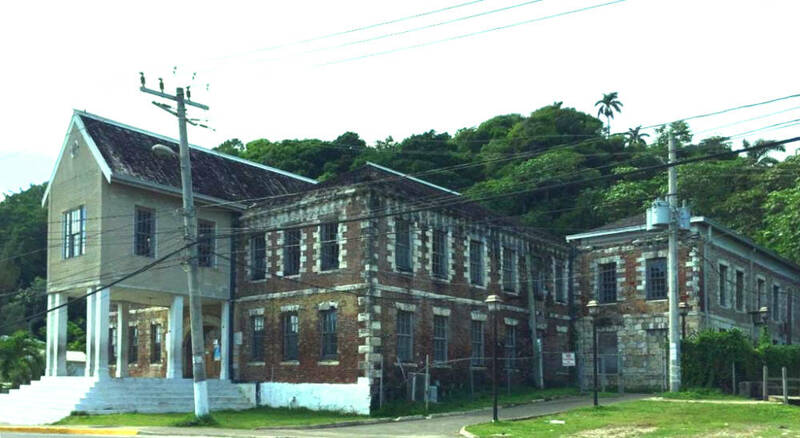 Right: Lucea Court House. c. 1817. Left: The Baptist Manse . Falmouth. 1798. Middle: Court House. Halfway Tree. 1807. Right: Town House. Montego Bay. 1776. 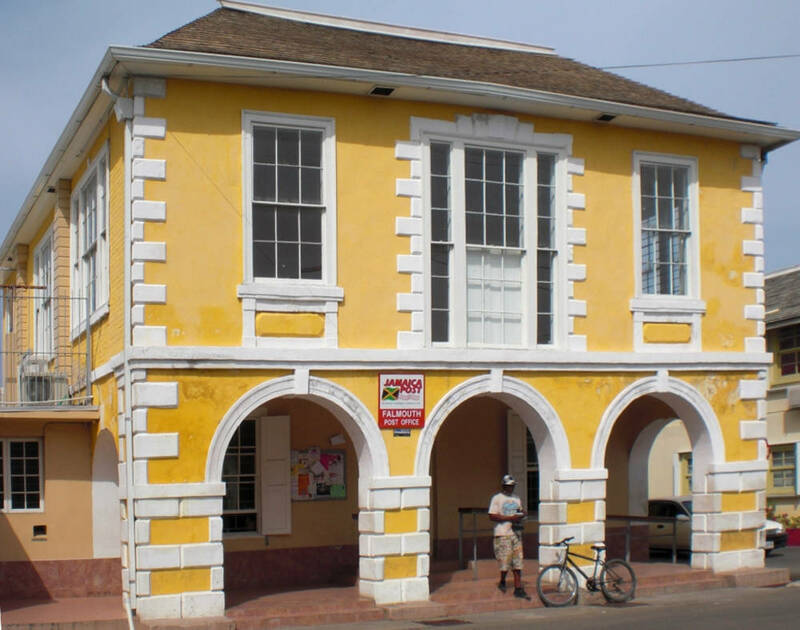 Lucea Town Hall to the west of Falmouth boasts a Palladian Court House dating from around 1817 when a rather oversized clock tower was added to the roof. In Montego Bay opposite St. James’s Church there is a classic Georgian town house dated 1776 and further east at Port Maria there is an enormous court house built in 1821, which apart from its ugly portico is probably the most classically Georgian office-building on the island. 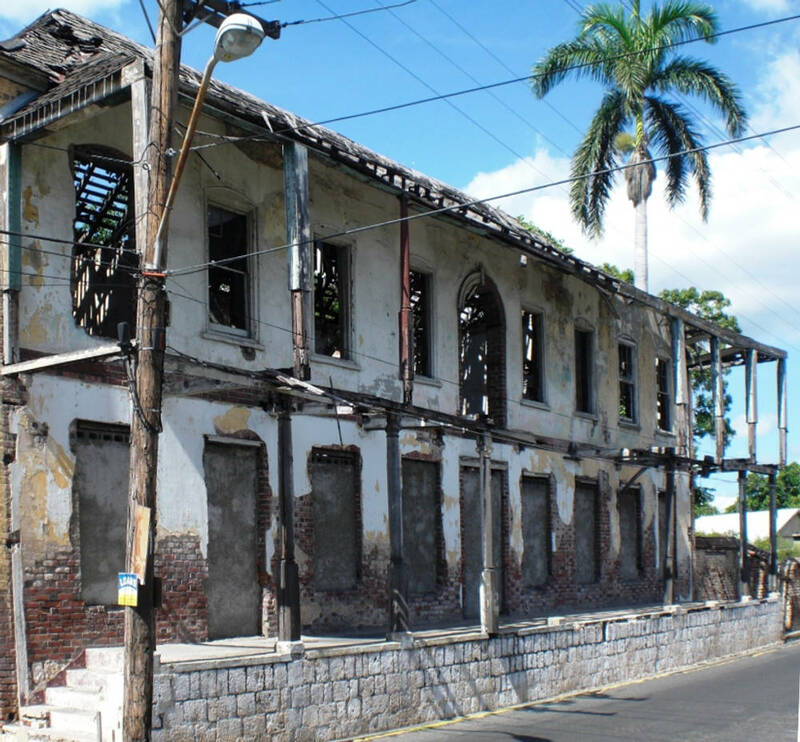 And finally at Halfway Tree, now a suburb of Kingston, is the St Andrew’s Court House, an iconic (if rather shabby) case of Jamaican Georgian which has survived earthquakes and hurricanes since its construction in 1807. 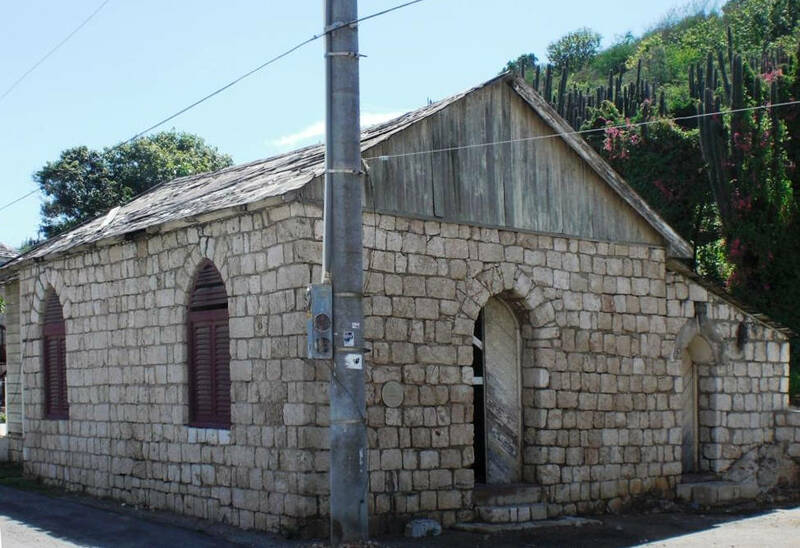 This small sample demonstrates the sheer variety of Georgian architecture in Jamaica, much of it in need of conservation but remarkable for surviving the torments of man and nature. Cundall, Frank. Historic Jamaica. London: Institute of Jamaica, 1915. Georgian Society of Jamacia. website, 2015. Green, Patricia. “The evolution of Jamaican architecture 1494-1838.” University of Pennsylvania MSc thesis, 1988. Hakewill, James. A picturesque tour of the island of Jamaica. London; Hurst and Robinson, 1825. Lane’s Masonic Records Online. 2011. Nelson, Louis P. The Falmouth Project. University of Virginia. Website. 2011. Virtual home of the District Grand Lodge of Jamaica. Website. DGL Jamaica 2015.